The school bus routes for Wolcott Public Schools are listed under the school that your student will be attending. You can find bus routes here. Parents should be advised that students will only be picked up at designated bus stops. All students should be outside, visible and ready for pick up. Please do not worry if a bus is late, especially at the start of a school year when it typically takes a few days for kindergarten children and new students to become accustomed to the bus routes and schedules. If, however, you have concerns about your bus being consistently late over a period of several days, please contact the Wolcott office at 203-879-1334. Wolcott High School – 9:30 a.m.
Tyrrell Middle School – 10:10 a.m.
Alcott Elementary School – 10:55 a.m.
Frisbie Elementary School – 10:55 a.m.
Wakelee Elementary School – 10:55 a.m.
W.F. Kaynor Technical High School – 9:05 a.m.
H.C. Wilcox Technical High School – 9:35 a.m.
Rotella Magnet School – 10:35 a.m.
Waterbury Arts Magnet School – 9:50 a.m.
Southington High School – 9:35 a.m.
Wolcott High School – 11:55 a.m.
Tyrrell Middle School – 12:25 p.m.
Alcott Elementary School – 1:20 p.m.
Frisbie Elementary School – 1:20 p.m.
Wakelee Elementary School – 1:20 p.m.
H.C. Wilcox Technical High School – 11:30 a.m.
Rotella Magnet School – 12:30 p.m.
Waterbury Arts Magnet School – 11:30 a.m.
Southington High School – 12:15 p.m.
Bristol Technical Education Center – 11:20 a.m. If there is a two-hour delay in Wolcott, the schedules for out-of-town students buses will based on the Wolcott delay. 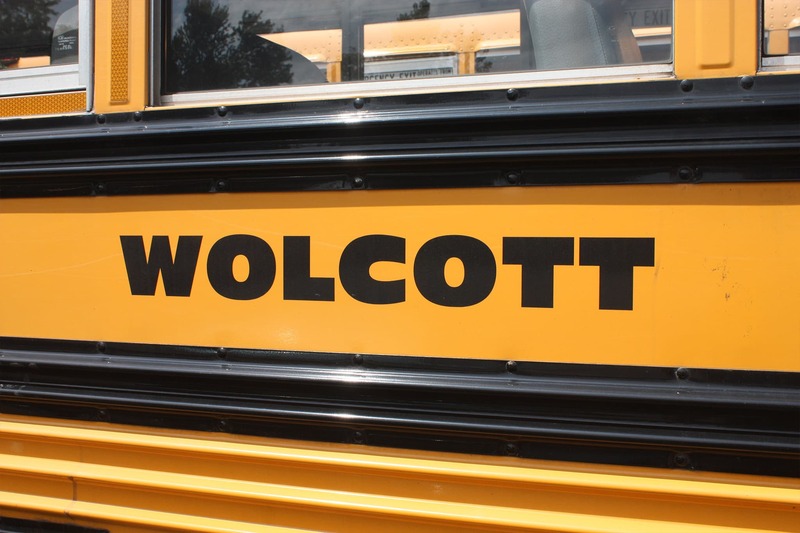 If there is a delay at an out-of-district school and NO delay in Wolcott, students will be transported according to the delay time for their out-of-district school. Out-of-district students are picked up and dropped off at designated stops. This applies to students attending Bristol Technical Education Center, H.C. Wilcox Technical High School, Maloney Magnet Elementary School, Rotella Interdistrict Magnet School, Southington High School, W.F Kaynor Technical High School and Waterbury Arts Magnet School. You can find the bus routes here. Elementary Schools – A parent/guardian or authorized adult must be present for drop off after school at each student’s designated bus stop. Students whose parents are not present will be brought to the Wolcott police station. Parents will then be responsible for picking up their children at the Wolcott Police Department at 225 Nichols Road. If you have any questions, please contact All-Star Transportation’s Wolcott office at 203-879-1334 or email [email protected]. The safety of students is the priority for All-Star Transportation, from the time they are picked up to the time they are dropped off. Our requirement that parents be present at the bus stop for pre-K, first- and second-grade pick-ups and drop offs is a reflection of our concern for safety. If parent is not at designated bus stop during a drop-off after school, the bus driver will return the student back to school. Parents will then be responsible for picking up their children at their assigned school. For students in grades 3-5, a parent does not need to be present for drop-off. In the event a change to a pick-up and drop-off schedule is needed during the school year, parents need to complete a waiver form and submit it to their student’s school office to request a change. 1. In order to maintain the pickup times listed below, students be at their bus stop five minutes prior to their scheduled pickup time. Consequences of breaking these rules is punishment at the discretion of your school principal. That may include suspension from riding the bus. Serious or repeated misbehavior might cause suspension or expulsion from school.